I made tofu by using the classic-style donabe again. It's so easy and tasting the freshly made homemade tofu is the best thing. All you need is the donabe (classic-style), a quart (1 liter) of pure soy milk, and 5 teaspoons of nigari liquid. Then, cook the soy milk and nigari mixture slowly until done. You can serve it right out of the donabe at the table ("sukui tofu"), but if you like to drain the liquid before serving for a little firmer style, you can use the strainer and cheesecloth to drain the liquid first. Tonight, I did the latter way by letting the liquid drain for about 30 minutes, then served in a bamboo basket. We call the fresh unshaped tofu in a bamboo basket "zaru tofu". I had the tofu with some sesame sauce and sliced shiso leaves, and it was fantastic!! 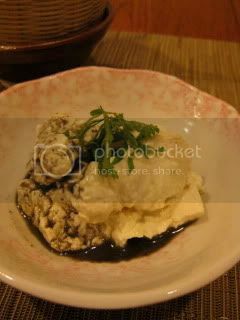 You can find the tofu recipe on toiro's website.